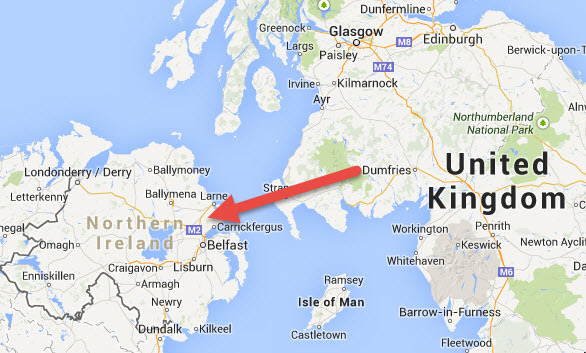 Ireland Straidnahanna is northwest of Belfast in Ballylinny, County Antrim, Northern Ireland in the map below and it is about 100 miles from Dumfries, Scotland following the red arrow on the map. Pennsylvania SECOND HOME: His second home was farther south in Donegal Township. Peter had this land surveyed on April 8, 1736. However, a patent was issued to Lazarus and John Lowry in 1744 and it is assumed Peter sold the land to the Lowrys. Lazarus Lowry was born in Ireland and arrived in in Donegal in 1729. Pennsylvania THIRD HOME: Peter Hairston and his son Andrew Hairston each recieved a "Blunston" license in 1737 for property west of the Susquehanna River in Pennsylvania. Samuel Blunston issued licenses for land West of the Susquehanna River starting 1734 for Thomas Penn. Samuel Blunston was the Deputy Surveyor and Justice of the Peace living in Lancaster County. At the time, these licenses were for remote land were ownership was being disputed by Maryland, Pennsylvania, Germans, Scotch-Irish and the Indians. 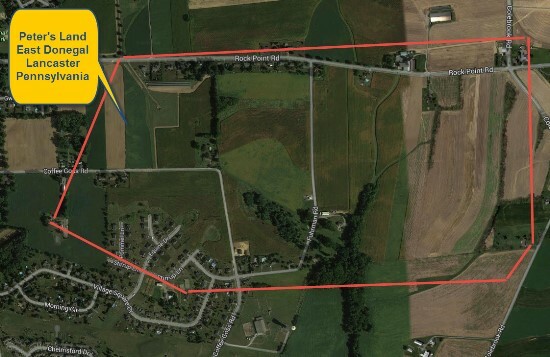 A Land Warrant was issued to John Peter Saulinger for 500 acres in "Hopewell Township on Conegocheege Creek adjoining Peter Hersteyne" on 24 July 1738. Hopewell Township was formed in 1735, at that time in Lancaster County, Pennsylvania. In 1741 the inhabitants of Hopewell changed the name to Antrim Township, after their previous homes in Antrim, Ireland. 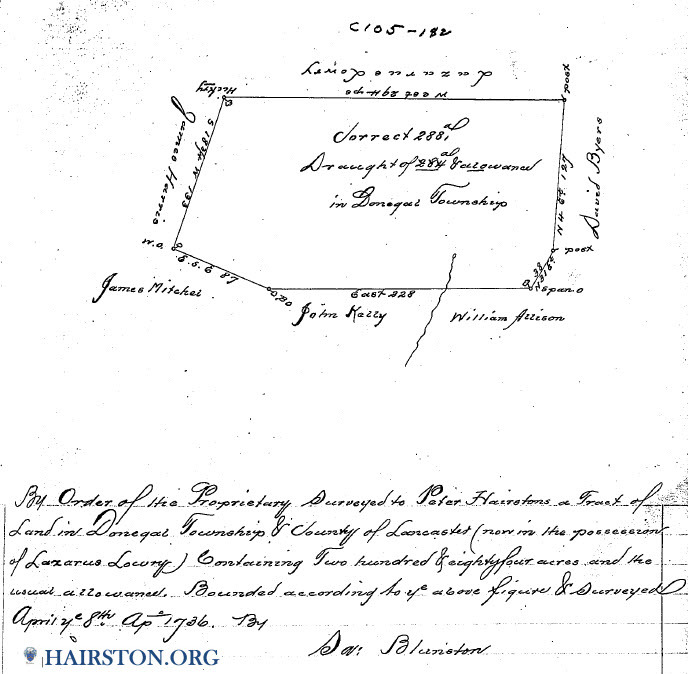 This land warrant indicates that Peter Hairston did settle the Blunston License land on Conococheague Creek. Court Record* On 15 Sep 1741, Peter Hairston, Michael Woods, John Woods, William Wallace and two dozen other residents signed a petition to have a road cleared from Thomas Morrisons to Michael Woods property in Goochland County. It is well known that, in 1734, Michael Woods led a group of families from Pennsylvania through the Shenandoah Valley to settle in Virginia. The gap in the Blue Ridge Mountains that Michael Woods led these families through was called "Woods Gap" until the name was changed to "Jarman Gap" in the 1800s. Michael Woods obtained his first patent in Goochland County in June 1737. 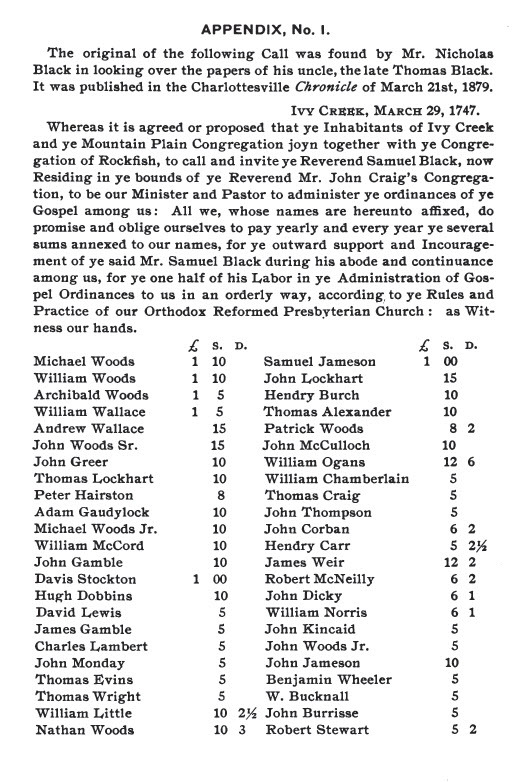 Michael Woods was a Presbyterian from Ireland and his grandson John Woods would later marry Agnes Anne Hairston, Peter's granddaughter. Property North Garden, Goochland County, Virginia - Peter Hairstone acquired a patent for 250 acres next to land owned by Robert Lewis. Robert Lewis was the grandfather of Meriwether Lewis of the Lewis & Clark Expedition. NOTE* Note: It is mentioned in several books that Peter and his wife had another daughter that married a Mr. Seldon or Shelly and moved to Kentucky. I have also heard that the name was Shelby, not Seldon. The Shelby family was in Pennsylvania and Maryland area when the Hairstons arrived in America. They were issued a Blunston License in Pennsylvania on Conecocheague Creek, moved to Virginia, were in the Virginia Militia and then moved to Kentucky and Tennessee. There is a quote of Gen. Shelby calling a Hairston his cousin. [S104] Contract between Sir Robert Adair, Peter Harstones, Andrew Allet and William Owens - 1726, PRONI - Public Records of Northern Ireland, 2 Titanic Boulevard, Belfast, Northern Ireland. [S221] Ellis, Franklin, 1828-1885. History of Lancaster County, Pennsylvania: With Biographical Sketches of Many of Its Pioneers And Prominent Men. Philadelphia: Everts & Peck, 1883. https://hdl.handle.net/2027/pst.000063629620 Hathi Trust Digital Library. [S3097] Pennsylvania Achives, Third Series, Volumn VIII, edited by William Henry Egle, M.D., Harrisburg, Clarence M. Busch, State Printer, 1896, Fold3.com. [S3456] Warrant Applications, 1733-1952. Harrisburg, PA: Pennsylvania State Archives., Ancestry.com. [S234] Indian Local Names with Their Interpretations, Stephen G. Boyd, (Published by the author, York, PA 1835). [S3421] Publications of the Genealogical Society of Pennsylvania, Vol. XII, No. 1, March, 1933, p.65, unknown repository. [S3411] Davis, Bailey Fulton, Albemarle County Virginia Deed Book 3, 1760-1763. Salt Lake City, Utah : Digitized by the Genealogical Society of Utah, 2016, Family History Library, Salt Lake City, Utah.